Gustav Klimt’s large painting Death and Life, created in 1910, features not a personal death but rather merely an allegorical Grim Reaper who gazes at “life” with a malicious grin. This “life” is comprised of all generations: every age group is represented, from the baby to the grandmother, in this depiction of the never-ending circle of life. Death may be able to swipe individuals from life, but life itself, humanity as a whole, will always elude his grasp. The circle of life likewise repeats itself in the diverse, wonderful, pastel-coloured circular ornaments which adorn life like a garland. Gustav Klimt described this painting, which was honoured with a first prize at the 1911 International Art Exhibition in Rome, as his most important figurative work. Even so, he seems to suddenly no longer have been satisfied with this version in 1915, for he then began making changes to the painting—which had been framed for long by that time. The background, reportedly once gold-coloured, was made grey, and both death and life were given further ornaments. 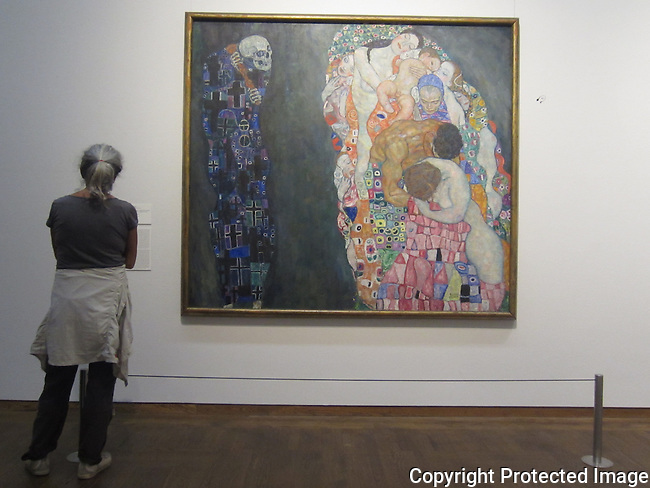 Standing before the original and examining the left interior edge of Josef Hoffmann’s frame for the painting, one can still discern traces of the subsequent over-painting, which was done by Klimt himself.